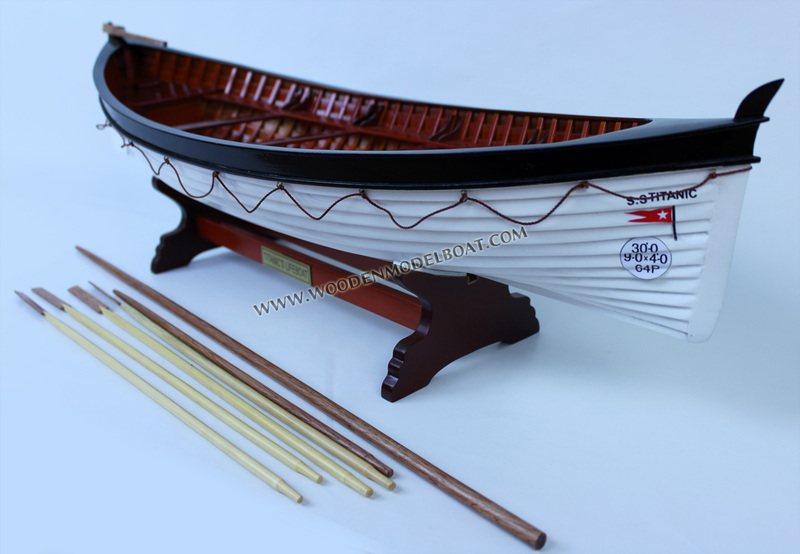 Model is handcrafted from hard wood with clinker build method, the inside is constructed just like the original boat. 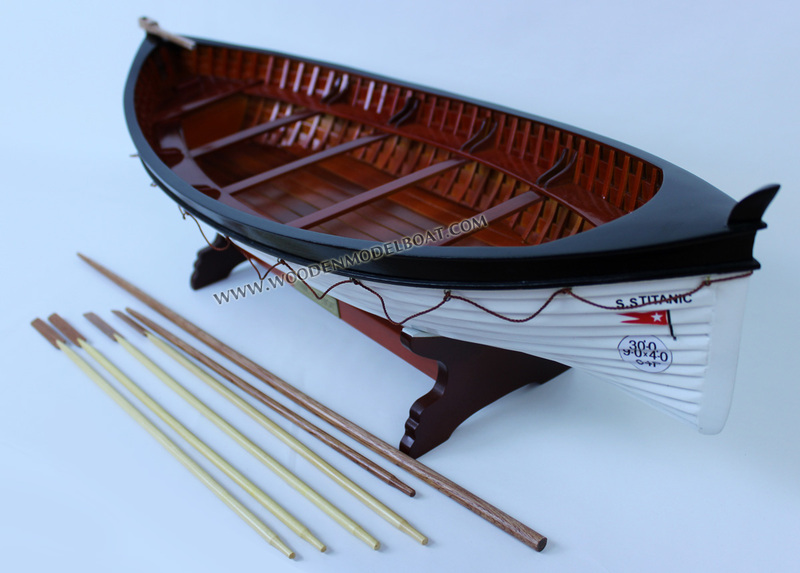 Model comes with two pair of oars and a base like shown photos. 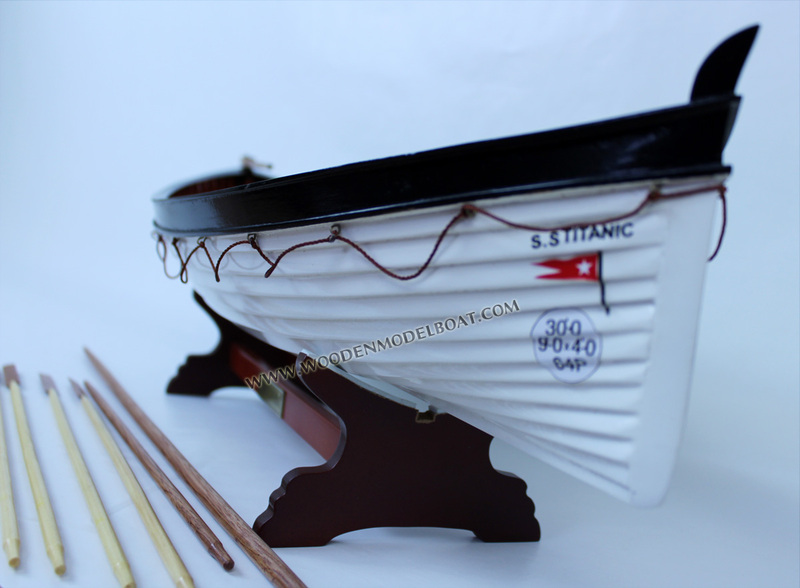 The lifeboats of the RMS Titanic played a crucial role in the disaster of 14–15 April 1912. One of the ship's legacies was that it had too few lifeboats to evacuate all those on board. The 20 lifeboats that she did carry could only take 1,178 people, even though there were around 2,223 on board. Titanic had a maximum capacity of 3,300 passengers. All 20 lifeboats were used, loading between 12:40–2:10 a.m., although Collapsible Boat A floated off deck partially submerged, and Collapsible Boat B floated away upside down minutes before the ship upended and sank. 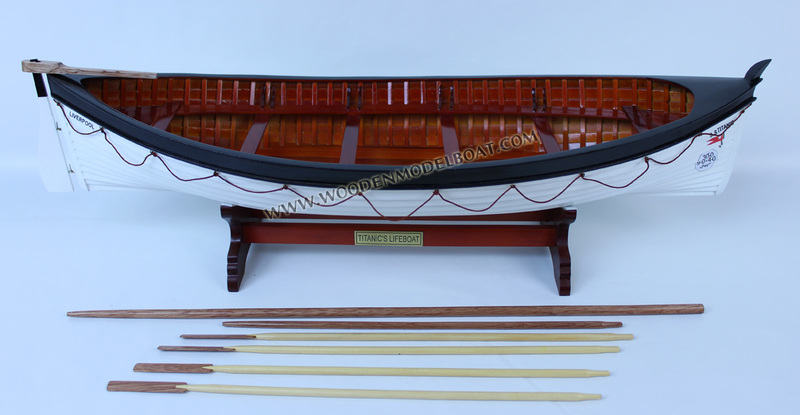 Many of the lifeboats carried only half of their maximum, there are many different versions as to the reasoning behind half filled lifeboats. Some sources claimed they were afraid of the lifeboat buckling under the weight, others suggest it occurred because the crew were following the strict maritime tradition to evacuate women and children first. Additionally, doors and hatches were locked to prevent passengers from lower decks accessing and storming the boats. Few men were allowed into the port side lifeboats, but the starboard side allowed many men into boats after women and children first. Some final lifeboats were over-filled, and passengers noted the seawater was near the rim of some lifeboats. As the half-filled boats rowed away from the ship, they were too far for other passengers to reach, and most lifeboats did not return toward the wreck, due to protests from passengers or crewmen to avoid being swamped by drowning victims. Two lifeboats returned to pull survivors from the water, but some of those later died. The RMS Carpathia did not reach the lifeboats until 4 a.m., two hours after the Titanic sank to the bottom of the sea, and the rescue continued until the last lifeboat was collected at 8:30 a.m. The survivors among the men were relatively more crewmen, then more First Class and Third Class, with 92% of men dying from Second Class. However, the third-class women and children also died in relatively high numbers, with 66% of those children dying. Although the sinking showed the number of lifeboats insufficient, Titanic was in compliance with maritime safety regulations of the time (albeit the Titanic disaster proved the regulations outdated for such large passenger ships). The Inquiry also revealed White Star Line wanted fewer boats on the decks, to provide unobstructed views for passengers and give the ship more aesthetics from an exterior view. 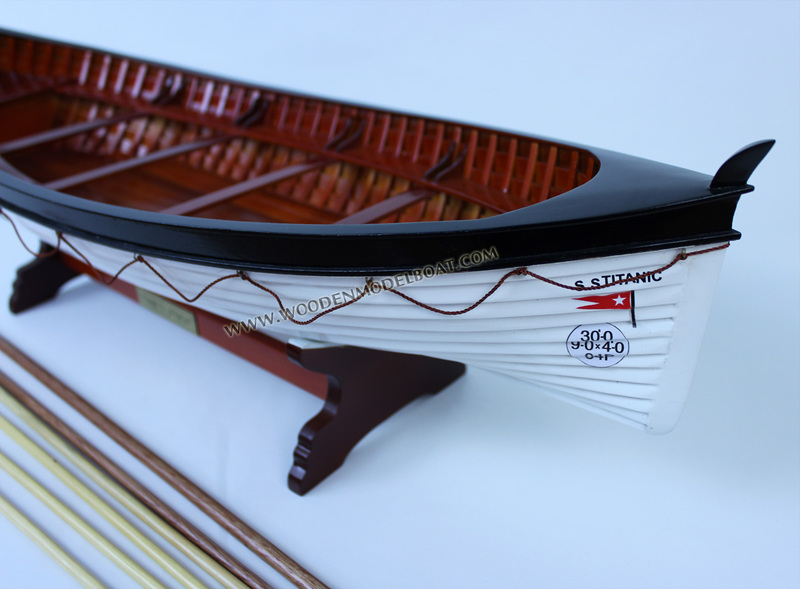 It was also believed in the event of an emergency, Titanic's design would enable her to stay afloat long enough for her passengers and crew to be transferred safely to a rescue vessel. It was never anticipated that all passengers and crew would have to be evacuated rapidly at the same time. Compounding the disaster, Titanic's crew were poorly trained on using the davits (lifeboat launching equipment). As a result, boat launches were slow, improperly executed, and poorly supervised. These factors contributed to lifeboats departing with half capacity. Around 1,500 people did not make it on to a lifeboat and were aboard Titanic when she sank to the bottom of the sea at 2:20 a.m. on 15 April 1912. Around 705 people, mostly women and children, remained in the lifeboats until later that morning when they were rescued by the RMS Carpathia. Those aboard the lifeboats were picked up by Carpathia over the course of 4 hours & 30 minutes, from about 4 a.m. to 8:30 a.m., and 13 of the lifeboats were also taken aboard. 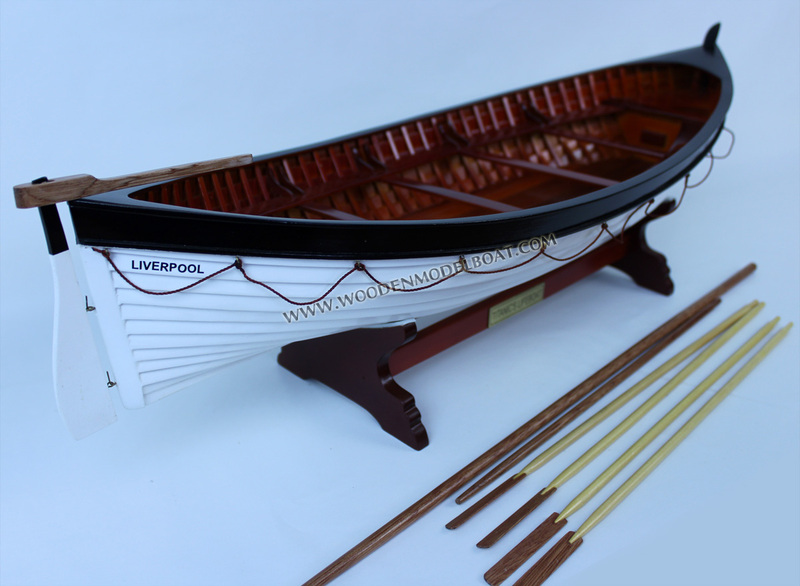 The lifeboats were returned to the White Star Line at New York Harbor, as they were the only items of value salvaged from the shipwreck, but subsequently vanished from history. 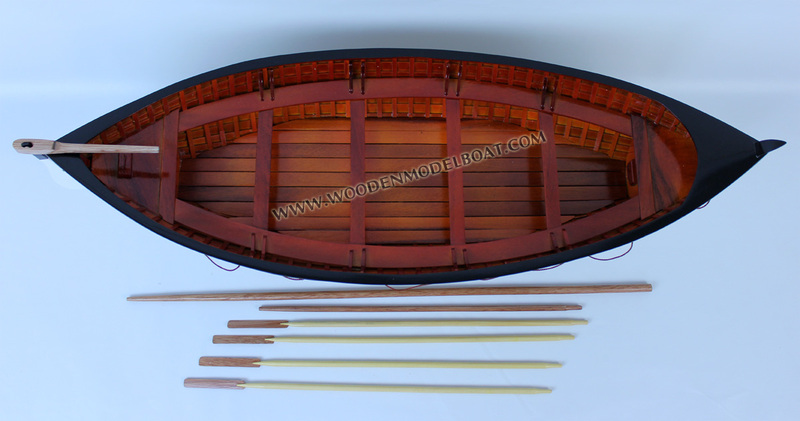 14 clinker-built wooden lifeboats, measuring 30 feet (9.1 m) long by 9 feet 1 inch (2.77 m) wide by 4 feet (1.2 m) deep. Each had a capacity of 655.2 cubic feet (18.55 m3) and was designed to carry 65 people. 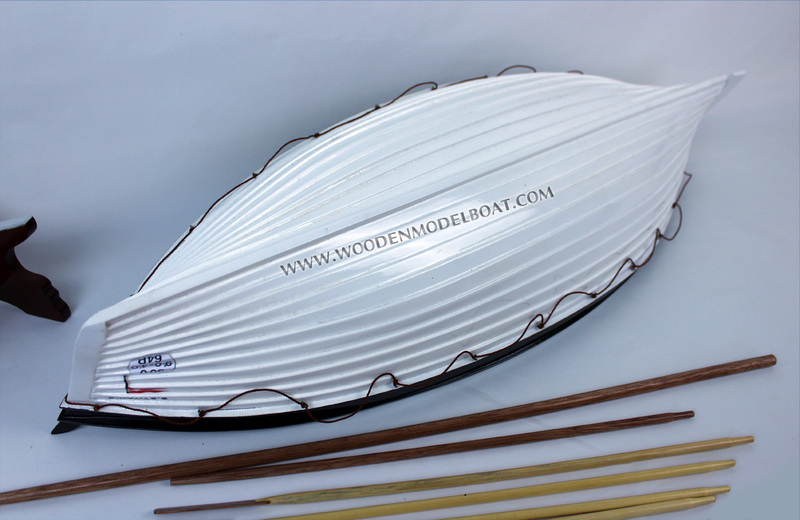 The rudders were made of elm – chosen because it resisted splitting – and were 1.75 inches (4.4 cm) thick. 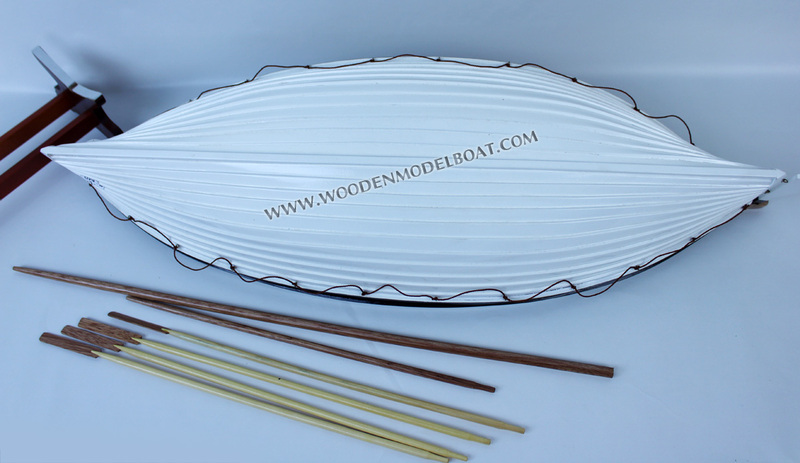 The exterior of the boats were fitted with "grablines" for people in the water to hold on to. 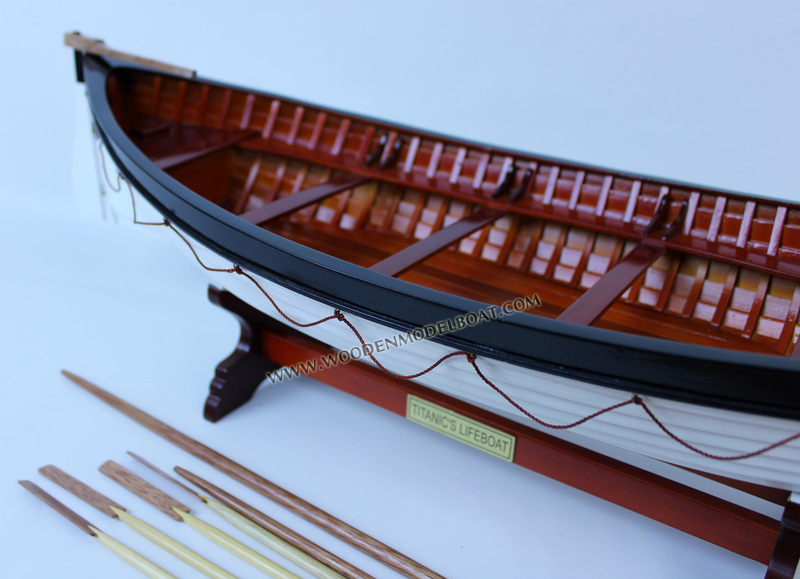 They were fitted with a variety of equipment to aid the occupants, comprising 10 oars, a sea anchor, two bailers, a painter (effectively a tow-rope) 150 feet (46 m) long, two boat-hooks, two 10 imperial gallons (45 l) tanks of fresh water, a mast and sail, a compass, a lantern and watertight metal provision tanks which contained biscuits. This equipment was not kept in the boats, for fear of theft, but in locked boxes on the deck. In many cases, the equipment was not transferred into the boats when they were used on 15 April and ended up going down with the ship. Blankets and a spare lifebelt could also be found in the boats.